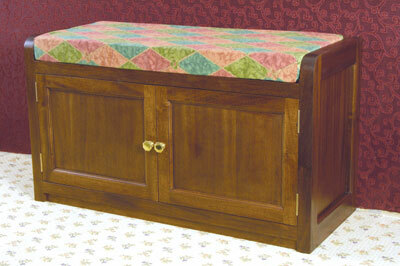 Here is a good cabinetmaking project that will create an attractive, compact piece of furniture to grace any home. It uses commonly available solid sapele and sapele-faced MDF or ply, which needs a dark mahogany finish to look its best. It has a foam cushion on the top and useful storage inside. Make up a full cutting list for all the solid components, expressing length, width and thickness of all items and the quantities. Saw out all the parts oversize to allow for planing down and trimming to final sizes. Ensure that your planer is well set up and the fence set dead square to the tables. Plane one face and edge, check for square and add face and edge marks so you know which are the good surfaces. Now machine down to size in the thicknesser, making sure to turn the components over to improve the finish on the already overhanded surfaces. All the major components except for the door parts and the internal support strips for the top panel can be cut accurately to length. Use a fixed dimension stop on the saw to ensure all like components are exactly the same length. The whole construction hinges, so to speak, on the end panels. Once these are built everything else can be fitted in between. These obviously need to be identical and a mirror image of each, particularly the biscuit joint positions. Although biscuit jointing is a quick and easy jointing method, because of the number and placement of the slots it gets a bit more complicated, so careful laying out is required. These are too thick to be joined by a profile and scribe cutter set, necessitating a double biscuit joint instead. So long as the stock is accurately thicknessed it is possible to machine the slots by sitting the biscuit jointer on a reference board working from each face rather than by using the jointer's fence. A 6mm wide x 10mm deep (1/4 x 3/8in) groove is run down the inner edge of each component first, using a groover on the router table. On the stiles this groove is 'stopped' so it isn't visible on the ends. Once all machining is done, cut out two 6mm thick, sapele-faced MDF or ply panels that fit in the groove almost to the full-groove depth. Glue and assemble the end panels, clamp up with sash cramps, check for square and leave to set. Once dry, ensure the surfaces are level, if necessary belt sand with the grain and take a small router and an ovolo cutter with a bearing guide and mould the inner edge of the outside of both panels. Note that the bearing needs to run clear of the centre panel. Now is the time, before full assembly, to machine the hinge recesses. Choose your cabinet hinges and make a simple jig to use with your router and guidebush. Machine all four recesses, but in the case of the two upper recesses move the jig along a bit towards the upper end in order to extend the slots so that the exposed part of the biscuit slots for the front rail can be covered by a patch piece. Square the corners of each recess with a chisel. Shaping of the front corners is done on the bandsaw or an accurate jigsaw using any suitable round object like a small paint tin to mark out. Once done, careful belt sanding is required to get a smooth even curve. The top is a 'sub unit' consisting of a 13mm sapele-faced ply panel for the top itself, with a100mm high x 40mm thick (4 x 13/8in) back rail and a 40mm high x 20mm thick (13/8 x 25/32in) front rail. The ply must be cut exactly to size with no rough edges. It will be the same length as the front and back rails plus an extra amount to run under the bottom edge of the top rail on each end panel until it almost touches the panel in the centre. Thus the underside of the top rail becomes the datum for the top side of the top panel. To find the width, mark out the rail position correctly on both end panels. Cut the top panel to width, offer it up to each end panel in turn and mark where each corner needs to be notched to fit. Use a fine-tooth saw to notch each panel corner and check the fit. Since the top panel is only 13mm (1/2in) thick and is expected to carry the weight of a person sitting on it, the biscuit slot needs to be offset towards the underside of the panel so that enough board thickness remains to take the strain. Mark slots for size 20 biscuits along the front and back edges and machine them on a reference board with the good surface underneath. My jointer makes a slot 8mm up from the base and this creates a slot in the board close to one face (this will be the underside). The two long edges are slotted in this fashion at regular intervals for No.20 biscuits and the front and back solid components are slotted to match; in the case of the 100mm (4in) upstand back section the slots are up from the bottom. This can be calculated by allowing 75mm (3in) above the top surface which is also the cushion thickness, then adding the 13mm (1/2in) board thickness which then determines the position of the underside of the board. From this you can work out where the biscuit slots will be 1/2 - do a test cut first to be sure. Use a straightedge as a fence for the jointer. The ends of the front and back solid sections need to be biscuit slotted. The front 40mm- (13/8in) high component has a slot offset downwards to break out in the carcass, not through the top! Where the hinge recesses have previously been extended, fit a patch piece so only the joint slot is showing. Cut the biscuits to fit. Apply glue and biscuits along front and back board edges, then fit on the solid sections and clamp up. Be very careful that the solid sections remain at 90 degrees to the board by checking with a square. Adjusting the cramp positions may be necessary to achieve this. The lower shelf needs similar treatment except in this case the back rail sits underneath the board and thus will need '10' biscuits, as there is danger of the slots appearing through the top of the board. Note how two solid sections are used at the front to create a plinth effect. The solid component ends need to be slotted at the front lower piece; the No.10 biscuit breaks out both top and bottom but remains hidden from view. The ends of this shelf finish flush against the top edge of the lower rail of each end panel. To slot this rail use a board pressed against it so the jointer can use it as a reference surface, resulting in the slots being 8mm down - or wherever your jointer's slot position is relative to the baseplate; these can be '20' biscuits. Once all edge slots are done, the front and back, the solid sections and the shelf board can be glued and biscuited together and cramped up, ensuring everything is square. Before the whole carcass is assembled all internal surfaces must be sanded to a finish. Any belt sanding scratches need to be removed with a fine-sanded finish generally; this is because the light sapele colour will be dyed down to a medium or dark mahogany and the dye will show up any scratches. Check that all slots are correctly cut and all pencil marks removed. It is possible to glue on one end and leave it to set before fitting the other end. This relieves the usual stress at assembly time a bit. The ends of the top panel are screwed into the underside of the end panel top rail. A square strip of sapele is then glued into place over it to hide the screws, improving the internal appearance as well as adding extra strength. "The whole construction hinges, so to speak, on the end panels"
The principle of a hinge recess jig is very simple. Select the hinge, cutter and guidebush, measure the cutter and guidebush diameters, and subtract the cutter diameter from that of the guidebush to get the amount you add to the length of the hinge to mark out the jig. Divide that figure in half and you have the extra amount you need to add to the hinge width when it is folded. Cut out a jig from 9mm MDF based on those two sizes, ensuring that all internal edges are flat and smooth. Now fix a slim strip underneath so the jig opening is positioned correctly on the door edge then, with cutter and guidebush fitted, plunge the cutter (power off) onto a flat surface, trap the thickest part of the open hinge under the depth stop and lock it. Unplunge and do a test cut making sure the jig is clamped onto the workpiece. Square out the recess corners and try fitting the hinge. Adjust the jig if it is not correct. Here is a simple answer to the age-old problem of easy height adjustment when the router is mounted in a table. I usually find drawbacks to using the commercial offerings and call my quick and simple answer the 'gentleman's knee block - an efficacious means of easily raising and lowering the motorised routing machine'. Seriously, by using a boxed cutter set under my foot, I can lift my leg up so the router body is resting on my knee, my foot, leg and thigh acting as a set of levers to alter the height setting with no fine adjusters in sight.